Alliy Moyer and Carlson won the 2013 $5,000 National Hunter Derby, which will be sponsored by Sapphire Riding Academy for 2014. Photo: Chicago Equestrian. Antioch, IL – July 15, 2014 – The Chicago Hunter Derby, presented by Chicago Equestrians for a Cause, is gearing up for this premier event September 5-7, 2014 at the beautiful Annali-Brookwood Farm in Antioch, IL. The headline event is Sunday’s $50,000 USHJA International Hunter Derby, sponsored by Canadian Pacific and Saturday’s highlight is the $5,000 National Hunter Derby generously sponsored by a new sponsor, Sapphire Riding Academy of Mettawa, IL. 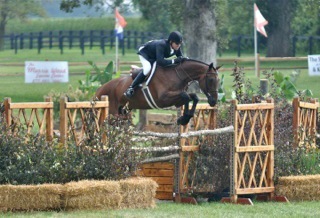 Doug Boyd showing in the 2013 International Hunter Derby. The prestigious derby is now in its sixth year of producing one of the best stand-alone derby events in the country while raising money for local charities. This year the proceeds from the event will benefit three charities; Ann & Robert H. Lurie Children’s Hospital of Chicago, the University of Chicago Cancer Research Foundation and The United States Hunter Jumper Association Foundation. In 2013, The Chicago Hunter Derby raised $150,000 for its charities and has contributed over $400,000 to local charities since its inception. The event will be adding an additional day of competition this year. On Friday, September 5th, two new classes will take place on the field. The $7,500 International Derby Welcome Stake will be held in the morning and the $2,500 National Derby Welcome Stake will take up the afternoon. The events are being held at the suggestion of the legendary George H. Morris, who judged the event last year. The classes provide another opportunity for exhibitors to experience the gorgeous field at Annali-Brookwood Farm. The additional day is made possible through the generous donation of Lane Change Farm and Kensel LLC. “We’ve been showing at the Chicago Hunter Derby since it began,” said head trainer of Lane Change Farm, Larry Glefke of Keswick, VA. “We love the show and are honored to be sponsoring this new set of classes. This derby event has grown so much and these welcome stakes will just add another great opportunity for horses and riders to compete on the field." 2014 promises to continue the tradition of the Chicago Hunter Derby with VIP seating and a stylish Sunday brunch including children’s activities sponsored by Rice Dairy, shopping, a silent auction and a Calcutta. Saturday will feature the $5,000 USHJA National Hunter Derby and the first round of the $50,000 USHJA International Hunter Derby followed by the more casual “Derby After Dark” party thanks to generous sponsorship of Land Rover Lake Bluff. Sterling@michelledurpettievents.com or visit the website atwww.Chicagoequestriansforacause.com.